NewSpace, as has been discussed, aims to further the commercialization of space, and is pushing the industry to evolve creative, cost effective business models. Advocates propose new ways to deliver space-based services using smaller, cheaper, highly capable satellite platforms. These services include imagery, communications, content delivery, civil sciences and government/military applications. Many of these new services are planned for small, low earth orbit (LEO) satellite platforms. One of the challenges, is to find ways for these fast-moving satellites to relay traffic between each other, and from space to ground in a more cost-effective way. To respond to these challenges, Xenesis, ATLAS Space Operations and Laser Light Communications joined forces to provide a service-level solution they refer to as the Empower Space Alliance. They intend to provide turnkey optical data distribution services to customer locations around the world. Their plan is to service all regions of space from LEO (Low Earth Orbit) all the way out to deep space. The alliance will provide space platforms with a choice between legacy communications via RF (radio frequency) or using optical data delivery, a high capacity, low-cost network, that delivers bandwidth to its destination – the customer - all on a single network, and without all the burdensome regulatory issues surrounding RF capacity. Satellite operators are examining new business models based on legacy satellite designs, with the goal of entering new markets and providing new services. Enterprises as well as agencies such as NASA and NOAA, not to mention the military, are all taking the NewSpace business sector seriously, and one of the key concerns is delivering data from space to earth, particularly as low orbit satellites orbit rapidly around the world. 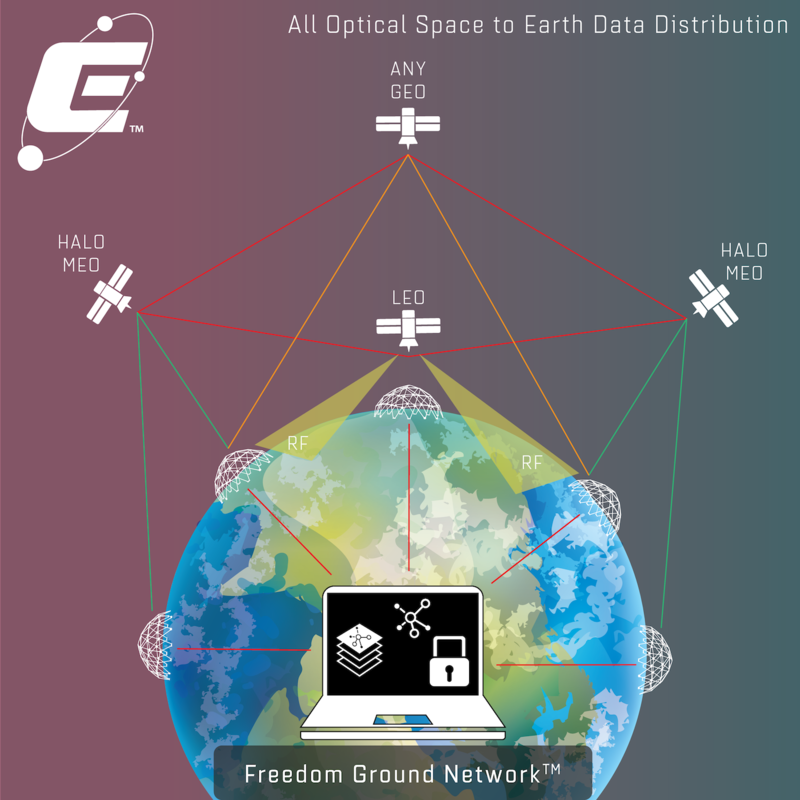 The Empower Space Alliance intends to bring an “All Optical Space to Earth” data distribution network together with the goal of sending data to its ultimate destination in a highly efficient, cost-effective and very secure manner. To do this, they bring three elements together as part of a single service partnership. First is network access designed to provide 24/7 access from near earth to deep space. Next is the delivery of the service, providing unlimited high throughput (to 100 Gbps), on demand, with a self-provisioned service. The final piece is network management to monitor and ensure distributed data delivery from end-to-end, to more than 100 PoPs (Points of Presence) around the earth. Through its founders and partners, Empower Space plans to offer a 10-100 Gbps optical unit licensed to the customer for their platform. The idea is to integrate it into a variety of space platforms from near earth to deep space, including Cislunar, or region between the earth and moon. Xenesis will provide the licensed optical unit, which will enable Empower space platform operator/owners to distribute their space-originated products including communications, imagery, content and data distribution services to over 100 points on the earth. The JPL designed laser communications transceiver provided by Xenesis is based on the Xen-Hub, a flight grade optical transceiver. It works with the Xen-Eye, a new patent pending optical receiver that contains no mirrors or moving parts. It needs no light-well and can track the entire sky. Xenesis claims it is nearly indestructible and can weather the harshest desert, or outer space. The platform will be customized for mega cube-sat, constellation or GEO platforms. Laser Light intends to deploy HALO, an All-Optical communications space network and connect it to existing terrestrial infrastructure, as well as remote, formerly unreachable locations around the world. HALO comprised of 12 Medium Earth Orbit (MEO) satellites will provide a service capacity of over 33Tbps. This will include 48 satellite-to-satellite 200 Gbps optical crosslinks, and 72 satellite-to-ground circuits with 100 Gbps bi-directional links. None of this requires any regulated radio frequency spectrum, such as C-band, Ku, Ka, V-band, etc. The HALO network will also provide a global SD-WAN comprised of satellites and Laser Light’s proprietary SD-WAN ground network, which is based on its patented StarBeamTM operating system. The network will support carrier-grade service, with enhanced redundancy, resilience and extensive security. The proposed HALO SpaceCable will interconnect over 100 customer PoP (Points of Presence) within over 20 SD-WANs around the world. ATLAS Space will manage and monitor the network from end-to-end, from the customer’s satellite platform to the data’s final destination, as all traffic passes over the Empower network, through both space and ground. The Empower alliance highlights the success of NewSpace as it continues to drive innovation in both product and service delivery solutions.